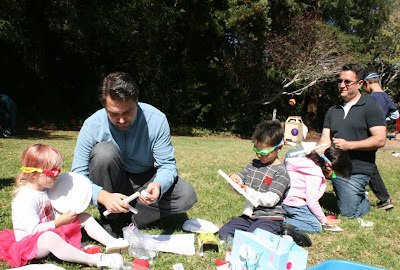 A while back we made some marshmallow guns out of pvc plumbing fittings with the kidletts. The lovely man that I am affiliated with blogged about it over on his own blog, FangleTronics (his blog is usually about electronics projects). 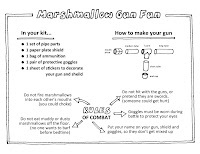 You can pop over to read that post here if you're interested in how to put together your own marshmallow gun. 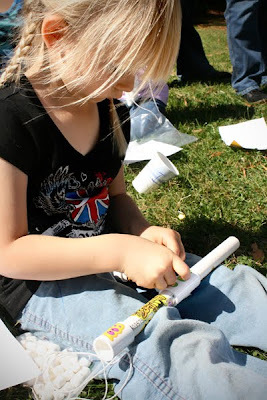 My older daughter really really wanted to have marshmallow guns at her birthday party a few weeks ago. I was a little bit reluctant seeing as there were going to be about 20 kids there and I had visions of some poor kid getting one point blank in the eye or something horrendous, so I said "we'll think about it". After a bit of a conflab we came up with a plan that would work. 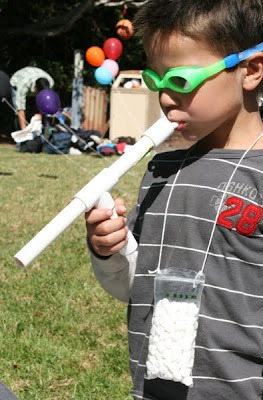 We put together twenty marshmallow gun "kits", so that the kids could make and decorate their own marshmallow guns using a simple instruction sheet, and then they could battle it out safely with a shoulder bag of ammo, a paper plate shield and some heinously cheap swimming goggles. 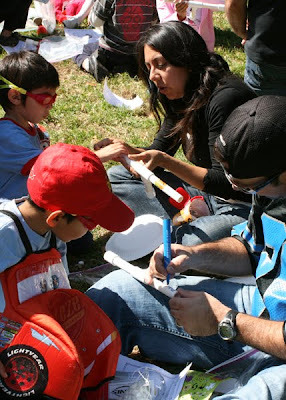 It was a really cute experience to go to Lowes with the kids and find and count out all the bits that we needed to make enough marshmallow guns for everyone. It ended up costing just about a dollar a gun and my daughter had fun counting out and checking off the parts we needed while her little sister tried on the larger plumbing fixtures like bracelets. 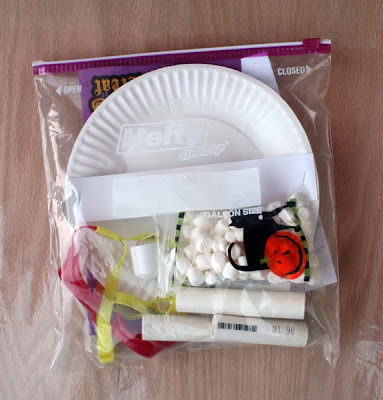 halloween treat bag filled with mini marshmallows for ammunition and with string tied to be a shoulder bag. paper plate shield that was just made by stapling a piece of card across a paper plate so you could fit your arm through and wear it on your forearm. The parents at the party helped their kids to put them together and read the rules of combat. Then the kids had fun blasting marshmallows at each other. 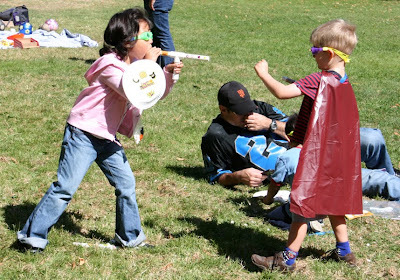 The shields doubled up as targets for the smaller kids to shoot at too. Only at one of our family's parties can you expect the party favours to be some pvc pipe and a pair of swimming goggles! The birthday girl was very happy that her freinds got to play marshmallow gun wars with her and I was very happy that no one got maimed by high velocity candy on my watch. Here's a copy of the instruction sheet I put together rather hurredly at 1.30am the night before the party. It ain't too fancy, but it did the job and you are welcome to use it yourself or adapt it's contents for your own marshmallowy warfare. Just click on the thumbnail below and that should take you to a full resolution image to save and print. It is US letter size, not A4, so if you want to print it on A4 paper then you'll have to remember to select "fit to page". 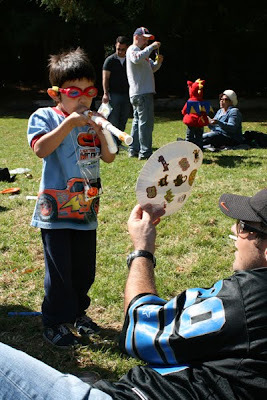 Judging by the amount of fun all of the dads at the party seemed to have with the whole thing, I recon it would make a great father's day party activity if you got a load of dads and kids together in teams for some marshmallow gun building and battling. Maybe with targets and games and challenges! I'm thinking this is something I might tackle for a family reunion. I guess the goggles might be a seasonal item around here, but at a dollar a kit this is tempting. Thanks for sharing everything. You do the absolute coolest stuff with your kids. I've been totally enjoying your blog and really appreciate you sharing everything in such a user friendly way. I just made your "milk jug trick or treat pumpkin pot" with my three year old and she loved it! We're doing our Thanksgiving this year at a beach in CA and I'm thinking I'll make up these bags for my adult siblings (1 sister & 4 brothers) to have a marshmallow fight with-they would totally have a blast! Thanks so much! That looks like an absolute blast! I love the rule about not eating dirty marshmallows it made me giggle. This is an awesome party idea! Thanks. Oh, KM, that is amazing! Best party favor I've seen ever, ever! To do a kit is even better than giving out the guns themselves. Clever! P.S. Very strange, and I blame the internet demons but I've lost some comments here in previous posts. I thought it was just me forgetting to hit "publish" at the end or something, but a reader said a similar thing about her own comment on one of my posts. Hope this one makes it here. What a fantastic party activity! I imagine this would be a hit with just about any age range, and I love that you made them into kits for everyone to decorate. Looks like great fun. We made these with my nephews a couple of years ago - but the birthday party idea was genus! I love the goggles and shields! Looks like a lot of fun. And a great idea for Father's Day. I've booked marked this post. That is fantastic! I'm definitely gonna bookmark this for when my lil guy is a bit older. You're genius. Oh wow! 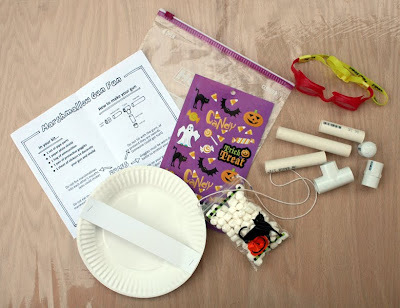 This is the best kid's activity ever! I love, love, LOOOVVVEE it! Thanks so much for this, I'll be linking. You're a genius! OH my goodness! This is the neatest idea for a party!!! Thank you so much for sharing! That is so cool! Isn't PVC the best? We've been making all sorts of neat things with it too, but I haven't gotten a chance to blog about it yet. I love the marshmallow guns! 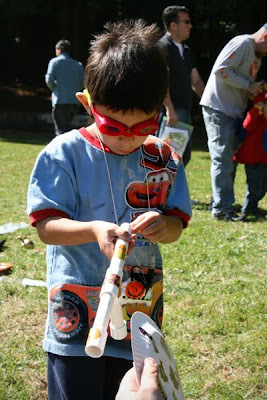 Mark made a potato gun out of PVC when he was a kid, and that thing made those potatoes FLY! Your marshmallow version is a lot more kid-friendly. Ok, I just couldn't resist when I saw this! I am the director for a local homeschool co-op, and we are having a party tomorrow. We have 85 people signed up, 58 of which are children of various ages. Soooo, I have been cutting pipe and bagging parts all afternoon! 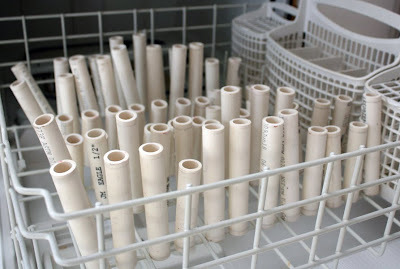 don't know if I ever want to see another pvc pipe again, but I still love the idea! Thanks so much for sharing. It looks like they had so much fun! We did this for our small halloween party today and it was GREAT! By the time we got around to eating the mallows, they were soggy with saliva. And you know what? The kids who loved this game were not preschoolers. They were 9 and 7 years old. Thanks! Adam, I love the pop bottle visor! There's no way we could have drunk that much soda in time to kit out the twenty kids though, no one in our home even likes soda that much, but I do pilfer other people's recycling, so I'll definately make a couple for my girls in the future. Thanks for the link! You are one awesome mom. I'm constantly on the lookout for fun and exciting ways to gather friends and family. Great party idea . I just love your creativity . We would love to do this for a Girl Scout event. My handy daughter is in charge of making these, and she asked me to find out if the mouthpiece was another piece of PVC pipe or something else. I love the ideas on your blog - thank you. We are going to do this for my son's birthday party, I think it's such a great idea! Where did you get your goggles? I found some at the Dollar store, but they are very cheap. Where did you get your goggles? I got some at the dollar store and they are so cheap! 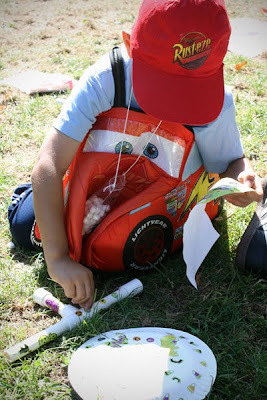 I love this idea and am going to do it for my son's party. Also, (I know this is a dumb question but...)do the kids put the marshmellow in their mouth and shoot it out, or right in the gun? 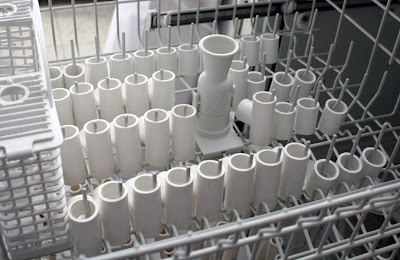 Lana: The mouth piece is another pvc pipe fixture. It's the one that is meant for joining two pieces of pipe in a straight joint. Grant: The goggles we got were from Amazon. I think it was a 20 or 24 pack (we had a lot of kids at the party!) They were really good quality, child sized and nice colours and also were fruit scented, which was weird but cool. They worked out at a bit less than a dollar each. I wish I had a pipe cutter! It'd be ON! We did this today for my 6 year old's birthday/Thanksgiving and we LOVED IT! The whole family was shooting and cracking up. Thank you so much for sharing this! !